The long-standing problem of official corruption in Russia is a major political issue for Vladimir Putin and his government, with public discontent over it remaining high. Some 200 officials, including eight unidentified senior officials, have been fired for “loss of confidence” over information in their income declarations for 2012, Kremlin chief of staff Sergei Ivanov told a meeting of President Vladimir Putin’s anti-corruption council Wednesday. In addition, the official number of corruption crimes decreased this year compared to last year, Putin told the council, although he expressed little optimism that measures against bribes were proving effective. The long-standing problem of official corruption in Russia is a major political issue for Putin and his government, with public discontent over it remaining high. 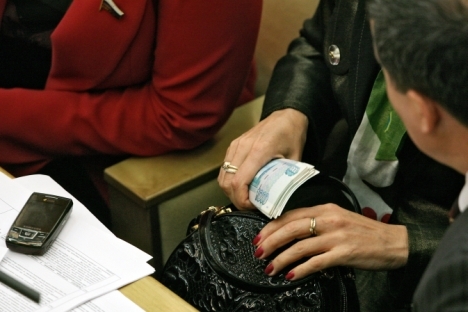 According to the Global Corruption Barometer for 2013, a survey prepared by Transparency International, only 5 percent of Russians believe that government measures to fight corruption are efficient, compared to 18 percent in 2010, the year when the government approved the national anti-corruption strategy. Ivanov said about 1.5 million officials submitted income declarations last year, and 3,000 of them were held legally responsible over their declarations, Interfax reported. Of the 9,500 senior officials whose declarations were analyzed, eight have been fired and some may face charges, Ivanov said, without elaborating. He named several officials who had been fired, including Alexander Dombrovsky, deputy head of the Federal Service for Defense Contracts, who was sacked after inspectors found undeclared assets in bank accounts bearing his name. “We will continue consistent work to root out corruption at all levels, irrespective of the ranks, titles, and official positions,” Ivanov said. Compared to the 1.5 million income declarations submitted by officials, the number of expense declarations, which were required for some officials by a more recent measure, was meager — just about 14,400, Ivanov said. A measure signed by Putin in May prohibited officials from holding bank accounts or property abroad. Ivanov said that 1,600 officials were found to have such assets, adding that 600 of them owned real estate in post-Soviet countries. Among their expenses, officials also tried to conceal millions of rubles and expensive Moscow apartments, Putin’s aide Yevgeny Shkolov told the council, RIA Novosti reported. Despite the dismissal of hundreds of corrupt officials, the amount of detected official corruption is going down, from 34,000 cases in the first six months of 2012 to 29,500 in the same period this year, Putin said Wednesday. Yelena Panfilova, head of anti-corruption watchdog Transparency International Russia, confirmed Putin’s doubts, saying by phone that the latest statistics only indicated “the efficiency level” of law enforcement agencies’ work. Putin said the decline in corruption came despite a measure that replaced prison terms for bribe-takers with fines, which he said the convicts avoid paying using legal loopholes. Just 8 percent of officials convicted of bribery are sentenced to prison terms, while the majority are ordered to pay fines, Putin said, adding that more lenient responsibility for bribery was enforced in 2011. “By all accounts, experience shows that this liberalization does not work properly,” Putin said. But Panfilova said the Criminal Code contained no recommendation to replace prison terms with fines for bribe-takers, instead allowing judges to choose between financial penalties and a “rather grave” prison term of up to 15 years. Taking this into account, it is not so much the severity of punishment but its “inevitability and the lack of selectivity” that matters in terms of deterring corruption, Panfilova said.